We live in an amazing time where the availability of rapid prototyping tools and expertise to use them has expanded faster than at any other time in human history. We now have an amazing ability to quickly bring together creative solutions — perfect examples of this are the designs for specialized arm prosthetics, Braille printing, and custom wheelchair builds that came together last week. Earlier this month we published details about the S.T.E.A.M. Fabrikarium program taking place at Maker’s Asylum in Mumbai. The five-day event was designed to match up groups of makers with mentors to build assistive devices which help improve the condition of differently-abled people. The participants were split into eight teams and they came up with some amazing results at the end of the five-day program. DIY Prosthetic Socket – a Human Machine Interface : [Mahendra Pitav aka Mahen] lost his left arm during the series of train bomb blasts in Mumbai in 2006, which killed 200 and injured over 700 commuters. He uses a prosthetic arm which is essentially a three-pronged claw that is cable activated using his other good arm. While it is useful, the limited functionality restricted him from doing many simple things. The DIY Prosthetic socket team worked with [Mahen] and [Nico Huchet] from MyHumanKit (who lost his right arm in an accident 16 years back), and fabricated a prosthetic forearm for [Mahen] with a modular, 3D printed accessory socket. Embedded within the arm is a rechargeable power source that provides 5V USB output at the socket end to power the devices that are plugged in. It also provides a second port to help recharge mobile phones. Also embedded in the arm was an IR reflective sensor that can be used to sense muscle movements and help trigger specific functions of add-on circuits, for example servos. Starting this weekend, a group of 65 invited Maker’s from various disciplines, along with 20 awesome Mentors, will gather at the Maker’s Asylum in Mumbai for the five day S.T.E.A.M. Fabrikarium program. The aim is to improve the capabilities of the differently-abled by building and expanding upon existing open source projects. At the same time, the teams will learn more about rapid prototyping techniques. Among the participants will be at least 15 differently-abled people who will be a part of the whole process of learning as well as providing their inputs on the problems being tackled. Participants have an opportunity to understand how design thinking works and work on improving the existing designs. Braille rap – using a 3D printer as a braille embosser. e-Trotti – a low-cost, removable electrical assistance for wheelchair use, made from electric scooter parts. Project Shiva – customized and beautiful upper limb prosthetics. Flying Wheelchair – a wheelchair specially adapted for use while paragliding. The Asylum’s fully-fledged workshop facilities offer a wood shop, a laser cutter, a CNC, several 3D printers, electronics tools and instruments and an infectious environment that will allow the participants to learn a lot during the five short days. While working on prototyping their projects, all teams will have constant access to a team of mentors and industry experts who will help solve their problems and give guidance when necessary. The Maker’s Asylum includes fully-fledged workshop facilities for the build process, and the team succeeded in bringing onboard a slew of industrial partners and supporters to ensure that the program can be offered to the participants for free. That is a great way to bring makerspaces, makers, and the industry together in a symbiotic program that benefits society. The program was developed in collaboration with My Human Kit, a company from France who selected the five open-source projects mentioned above. The Fabrikarium is made possible via Bonjour-India, which fosters Indo-French partnerships and exchanges. Hackaday is proud to be a part of this program and will be present to help document all of the awesome projects. Participants will share their progress on Hackaday.io, so watch for updates over the coming week. To get an idea of what to expect at the S.T.E.A.M. Fabrikarium 2018, check out the video from an earlier version embedded below. The Intel 8085 microprocessor was introduced 40 years back, and along with its contemporaries — the Z80 and the 6502 — is pretty much a dinosaur in terms of microprocessor history. But that doesn’t stop it from still being included in the syllabus for computer engineering students in many parts of the world. The reason why a 40 year old microprocessor is still covered in computer architecture text books instead of computer history is a bit convoluted. But there’s a whole industry that thrives on the requirements of college laboratories and students requiring “8085 Microprocessor Training Kits”. [TisteAndii] just finished college in Nigeria, where these kits are not locally built and need to be imported, usually costing well over a 100 dollars. Which is why his final year project was a low cost Intel 8085 Microprocessor Trainer. It’s a minimalist design with some basic read/write memory, program execution and register inspection, with no provision for single stepping or interrupts yet. The monitor program isn’t loaded in an EEPROM. Instead, a PIC18 is used and connected to the 8085 address, data and control pins. This makes it easier to write a monitor program in C instead of assembly. And allows use of a 1.8″ LCD with SPI interface instead of the more usual 7-segment displays used for these kind of kits. [TisteAndii] built a 6×4 keyboard for input, but couldn’t solve debounce issues and finally settled on a 5×4 membrane keypad. Being a rookie, he ended up with a major flaw in his board layout — he missed connecting the SRAM and the PPI devices to the data bus. A bunch of jumper links seemed to solve the issue, but it wasn’t perfect. This, and a few other problems gave him a lot of grief, but towards the end, it all worked, almost. Most importantly, his BoM cost of about $35 makes it significantly cheaper compared to the commercial units available in Nigeria. While some hackers may consider this a trivial project, it solves a local problem and we hope the next iteration of the design improves the kit and makes it more accessible. This week in [Hackenings], we’ve got a full roster of interesting upcoming events scattered all over the world. Can’t afford airfare to India, but Dublin is in the next county over? We’ve got you covered. 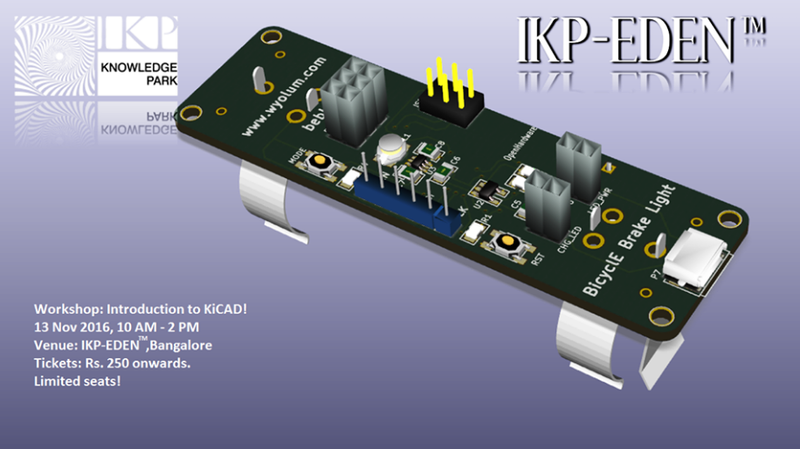 IKP EDEN, in Bangalore, is hosting an Introduction to KiCad workshop on Sunday, Nov 13 from 10:00-2:00 pm. If you’re just getting started with PCB layout, or just want a quickstart learning KiCad, Hackaday contributor [Anool Mahidharia] will be there to show you how! Sign up on the link above, and bring your laptop with KiCad already installed. TOG hackerspace in Dublin is putting on their fifth annual Science Hack Day, a 36-hour hardware and software hackathon on Nov 19 & 20th. Looking through their photos, past creations have included a laser mission-impossible crawl-through maze thing, some kind of freaky turtle, and many objects that move, make noise, or otherwise amuse. Do you have what it takes to meet the needs of DevOps, Agile, and Cyber in the Enterprise Environment? Interested in Disruptive Cloud Computing or Mobile First Growth Hacking? Can you rub two buzzwords together and come up with marketing gold? Then you might have a fun time at the shack hackerspace in Stuttgart on Nov. 19th, for the eloop 2016 conference (translated here). A full day’s talks include topics such as “Enterprise Patterns”, “Good Enough”, and the “Cult of Done Manifesto” as it relates to computer security. “What’s discussed at eloop today moves the digital markets of tomorrow.” YOLO! If you’re a UK citizen, you can vote to get the Swindon Makerspace some community funding so that they can furnish a new space. Why not? And if you’re in Huntsville, Alabama, or environs, don’t forget Makers Local 256’s Retro Gaming night tonight (Saturday, 12th). 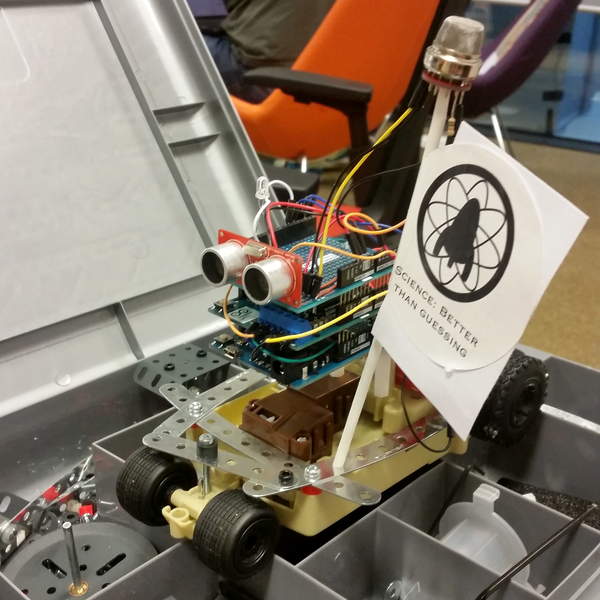 [Hackenings] is our weekly Saturday morning (US, Pacific Time) roundup of what’s going to be going on in the hackerspace world in the upcoming week. If you’d like us to cover your event, email us at tips@hackaday.com and put [Hackenings] in the subject so that we don’t miss it. Thanks! Slit lamps are prohibitively expensive in the third world areas of India where they are most needed. An invention that’s been around for over a hundred years, the slit lamp is a simple-in-concept way to see and diagnose a large array of ocular issues. Since they are relatively old by technological standards, the principles behind them have become more and more understood as time has gone on. While a nice lab version with a corneal microscope is certainly better, innovations in manufacturing have brought the theoretical minimum cost of the device way down, or at least that’s what [Kewal Chand Swami] hopes. His design aims for portability and cost reduction. It must be able to travel to remote locations and it must be significantly cheaper than the lab versions. It uses off-the-shelf lenses in a 3D printed housing with a simple LED torch, the kind you can buy for a dollar at the check-out stand. The assembly slides onto the user’s head and is held there with straps. The doctor can adjust where the slit the lamp shines and also look through a microscope to diagnose the issue. Hopefully devices like this will see similar community support to the prosthetic projects we’ve covered. The release of the Ringing Bells Freedom 251 means exciting things for India, and if it goes well possibly the hacker community, too. This $3 device comes with all the things you’d expect from your standard smartphone. Considering any of the individual components alone (4″ IPS screen, cell modem, 1450 mAh battery, 1.3 GHz quad-core processor, 3.2 MP front and 0.3 MP rear cameras) could cost more than the whole thing put together, some skepticism is warranted. There is speculation about how this is possible given Ringing Bells’ claims of no government subsidies. Considering the prototype presented to the media was from Chinese company Adcom, this may be a big scam in the making. The BBC does an examination of the many ways this seems sketchy, including the lack of appropriate government approvals (like the Indian equivalent of the FCC), and the experience of the company selling it (established in 2015). Still, consider us curious and hopeful that we may have a new tool as useful and cheap as the ESP8266 has been. That said, it will be interesting to see if the company can maintain stock and limit hardware sales to their intended market or will a curious world electronics ecosystem make them a scarce stock item.